WHERE, oh, where to begin, other that at the beginning? SOME readers may be familiar with this investigative journalist’s professional background, at least a part of it. This particular arena involved being a co-owner of a NY/NJ based corporate tax practice, that which involved a few core expertises. BUT those which are germane to this discussion revolve around two intersecting/converging points of interest: forensic tax/accounting and nonprofits. A two-fer. But do keep in mind that our office was called upon to testify as “expert witnesses” in certain dicey cases. Let’s just leave it at that. IN this regard, the following from this site’s “About” tab should serve as a foretaste: I am an investigative journalist and independent op-ed contributor to various Zionist and Conservative media outlets. I contributed to an in-depth investigative series at FrontPage Magazine with Lee Kaplan from 2003-2007. We are still working together….. He utilized my foundation in forensics and investigative journalism to “follow the jihadist money.” Unfathomably, the ISM was able to accomplish the above money laundering, courtesy of their IRS 501(c)(3) tax-exempt status. Specifically, my name appears at the end of the expose’, ‘Does The Pro-Terror Left Violate U.S. Tax Laws’? READERS, the above is just the tip of said “following the jihadist money”. NOW, anyone who knows their way around this dual-based arena also understands that a core component to nonprofit money laundering (often intersecting with narco-terror) revolves around “inter-related” parties. Mind you, one of the biggest “no-no’s” (and there are enumerable) within the IRS’s guidelines, in order to retain a nonprofit’s status, is to stay CLEAR of any “co-mingling” of parties/vested interests. It is important to understand IRS guidelines about conflict of interest when structuring the board of directors for a nonprofit organization. ** A conflict of interest is a transaction or arrangement that might benefit the private interest of an officer, board member, or employee. Conflicts of interest in a board of directors can take several forms. Related parties on the board, board members related to employees, certain transactions, and dual-capacity individuals all present a conflict of interest. While it might not be possible to avoid a conflict of interest in every situation, it is best practice to avoid or minimize them. Understanding how the IRS defines relationships and conflicts of interest is important when determining what qualifies as the organization’s quorum. A quorum is defined as the minimum number of members of a group who can officially meet to discuss business and vote on decisions. In a nonprofit setting, a quorum is the minimum number of unrelated board members needed to count as an official meeting. For example, if a board of directors is comprised of five individuals, in most cases three of these board members can meet and satisfy quorum. However, if a board is comprised of five individuals, of whom two are related, satisfying quorum becomes more complicated. If both related members are at a meeting during a voting situation, all five board members must be present to satisfy quorum because the majority of board members present must be unrelated. WHILE there are volumes of tax guideline resources devoted to the subject of “non-compliance”, suffice to say that the above is the best in layman’s terms. THUS, let us head over, once again !, to one of the main umbrellas for the Muslim Brotherhood Mafia cited at this site – the Muslim American Society! “Creeping Sharia” website posits: How many organizations does a person need? Well, apparently one is not nearly enough……. 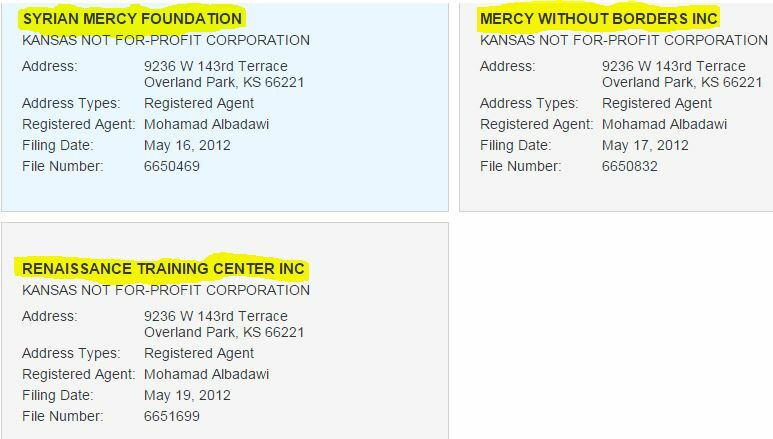 I have no idea how many organizations actually exist in Kansas that are run by the Muslim Brotherhood affiliated (MAS) Muslim American Society. However, I know there are more than an “honest” person really needs! 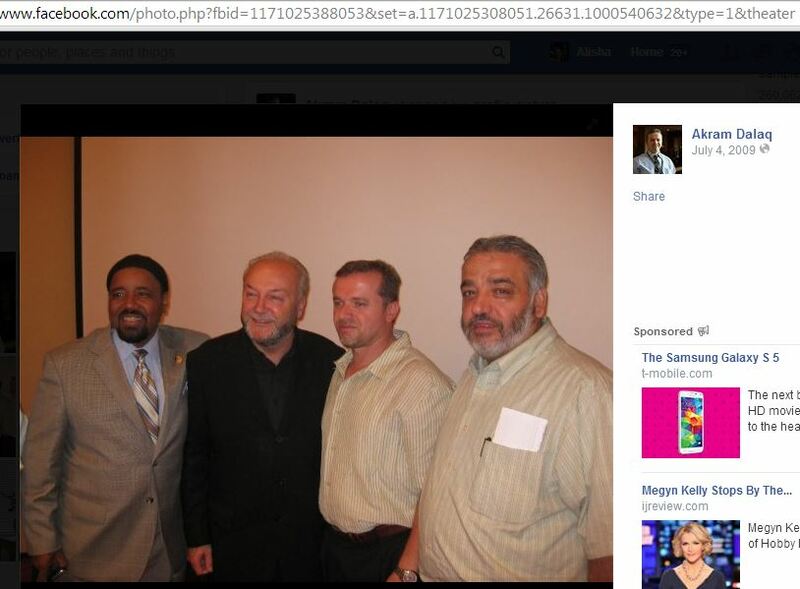 Lets start with Mohamad Al-Badawi, the official head of the Kansas branch of the (MAS) Muslim American Society. 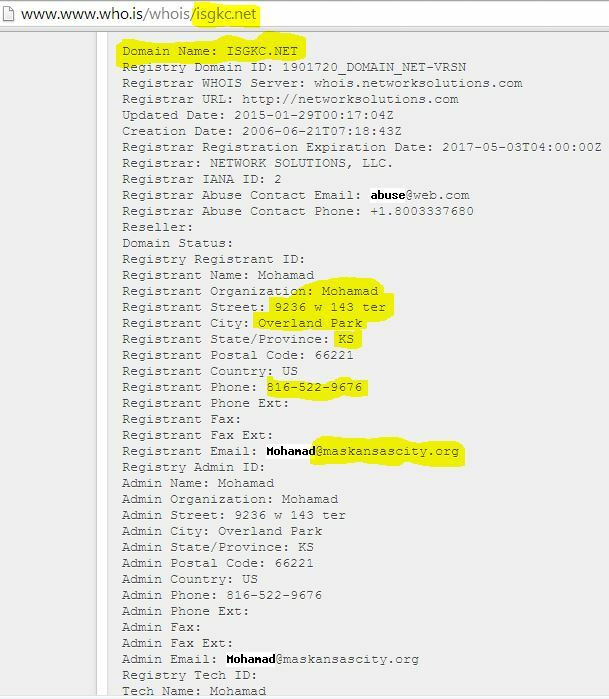 An online search reveals Mr. Albadawi is the “registered agent” for 5 non-profit orgs created within days of one another? Who in the hell needs 5 non-profits in this time span? My hunch is a sneaky little jihadist, but that is my biased opinion, you can judge for yourself as your read. (blogger’s note: refer to the above “inter-related” parties!) Now, I may be way off base, but why would all of this be required? What is the point of this? I am open to suggestions if anyone would care to enlighten me. I have my own opinion on why so many orgs are needed, but that will be made clear to readers in good time. For now lets continue to see how many other orgs. and groups Mr. Albadawi is affiliated with…… Oh, yes, there are more! 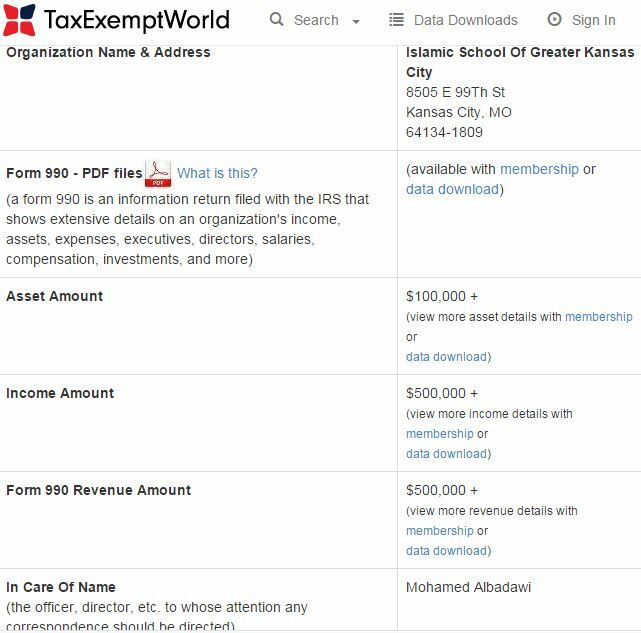 As seen above Mr. Albadawi is also the registered agent for the Islamic School of Greater Kansas City. It should also be noted that Albadawi also ran the old website for the School going back to 1999 when it was ISGKC.net. The Principal of the School at that time was Hamed Ghazali. Mr. Ghazali is a well known Muslim Brotherhood “civilization jihadist” that we will talk about later in this post. For now lets keep going through the continuing list of organizations that Albadawi is affiliated with. Mr. Albadawi served on the Board of Directors for the Islamic Society of Greater Kansas City from 1995-2004 Mohamad Albadawi was also the Convention Chairman of the 1993 (MAYA) Muslim Arab Youth Association Convention in Detroit. He is quoted in The Argus-Press as saying “Muslims parents were worried about their children becoming OVER-AMERICANIZED, losing their Arabic language, and the culture of their homeland.” Lets not stop now, this is just getting good! Show me the MONEY!!!!!!!!!! 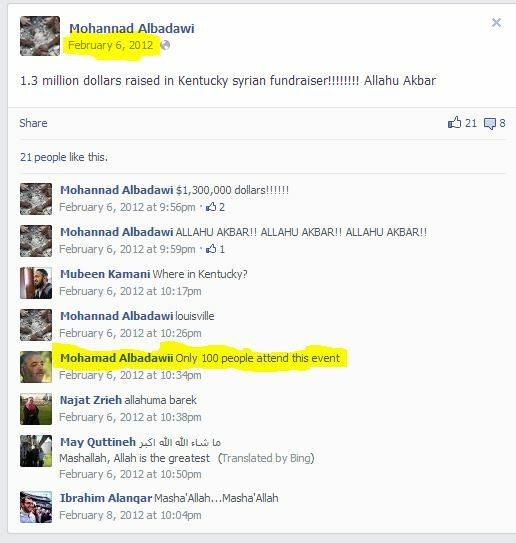 A facebook post by Mohannad Albadawi, the son of Mohamad Albadawi claims they raised 1.3 MILLION Dollars at a Kentucky fundraiser. Mohamad Albadawi also commented that only 100 people attended the event……. Video from July 2014 in Kansas City showing Mohamad Albadawi and other ISGKC/MAS leaders protesting at the Plaza Fountains. Mohamad admits on camera that he likes Sayyid Qutb, Abdullah Azzam, Yusuf Al-Qaradawi, and Hasan Al-Banna (founder of the Muslim Brotherhood)……… Before you watch the short video exchange below, just a short bio on each of the four names referenced in the video. Abdullah Azzam a.k.a. Father of Global Jihad was a Palestinian Sunni Islamic scholar and theologian and founding member of al-Qaeda. Yusuf Al-Qaradawi – Spiritual Head of Muslim Brotherhood Wanted by Interpol as of Dec. 2014, Qaradawi is charged with incitement and assistance to commit murder, helping the prisoners to escape, arson, vandalism and theft. Hasan Al-Banna – Founded the Muslim Brotherhood in 1928 –The Brotherhood found a soulmate in Nazi Germany. The Reich offered great power connections to the movement, but the relationship brokered by the Brotherhood was more than a marriage of convenience. Long before the war, al-Banna had developed an Islamic religious ideology that foreshadowed Hitler’s Nazism. There’s more. Read it all at Causing Fitna’s site. Muslims have figured out that the legal system in America is their playground. It’s how they can legally cover their tracks to do almost anything they want without anyone connecting the dots. Case in point is this recent post over at Money Jihad: 4 “Swedes” used 6 front companies to fund ISIS. Of course they were about as Swedish as Tony Soprano. OH, dear! The “creeping sharia” website needn’t query as to the whys and wherefores…its sleuths are pointedly on target…been there, done that…on a multiplicity of levels! LEST anyone believes that Kansas is a “special” case, well, this is so far from the truth that it falls off the charts. This site guarantees that EVERY state has the same non-profit terror hydra orgs, and the IRS knows this too. Yes, they are well aware. Informed. REST assured, if this investigative journalist’s expertise was unleashed in a court of law against the Muslim Brotherhood’s operations in America, there would be such a lengthy list of Exhibits, a U-Haul would be required. It would be proven that their tentacled hydras violate a laundry list of IRS rules, demonstrably creating a clear and present danger to the national interest! YES, this is the intersecting point between being an investigative journalist, coupled with forensic expertise within the nonprofit (for-profit too) arena. INDEED, a non-tainted U.S. court of law would have enumerable requisite players (other than those already in jail, due to the Holy Land Foundation terrorism trial) in handcuffs, before they knew what hit them, even if it meant constructing new Fed facilities to house them! This entry was posted in Uncategorized and tagged "Creeping Sharia", "inter-related" parties, About, Criminal Enforcement Fraud Division, forensic investigation, http://islamexposed.org/2015/03/01/muslim-brotherhoods-u-s-nonprofit-tentacleshiding-in-plain-irs-sight/, http://joeforamerica.com/2015/03/muslim-brotherhoods-u-s-nonprofit-tentacles-hiding-plain-irs-sight/, http://www.israelsvoice.org/2015/03/01/muslim-brotherhoods-u-s-nonprofit-tentacleshiding-in-plain-irs-sight/, IRS guidelines, Islamic Society of Greater Kansas City, Muslim American Society, Muslim Brotherhood's operations in America, narco-terror by Adina Kutnicki. Bookmark the permalink.